Remember last year when I said I was afraid of wearing culottes and then bought a pair and essentially couldn't get enough of the wide leg babes that have replaced most of my jeans? Well, it happened again, but this time with something a bit scarier. Enter the flare. Oh, the flare. I haven't owed flared anything since I was a pre-teen. I've no idea why but the flare became the biggest faux par of the trouser wearing world, kinda like the boot cut. It was skinny or nothing. Then styles like the mom Jean came in, the boyfriend fit breaking away from the circulation cutting skinny and then, well the flare has slowly but surely started to resurrect. After watching Girl boss a few months ago and seeing Sophia strutting around San Fran Cisco in her flared baes left me needing a pair of my very own post haste. I'd been eyeing up a couple of pairs of velvet numbers but never really felt like they were ''the ones'' In the end, I just gave up the search and forgot about my bell bottom endeavour. That was until I hit the sales in York with my mum last Wednesday. Liz was busy trying on a dress when I spotted the ones. I have no idea what it was but I knew that I needed them more than ever, it was the colour, the fact the flare was ridic and they were stupidly long - and with my legs is never heard of. There was only one pair left in a size small and I hoped to god they fit. I was delighted when I got them home that I could do up the zip, I managed to bag the perfect flares for £5.99. They kinda remind me of the school trousers you used to wear that had the biggest flares at the bottom and if you stood in a puddle they for what ever reason grew bigger, please someone tell me they also used to do that or remotely knows what I'm talking about . . . . I was a little concerned about the sheer length of the trousers, wondering if they would look too big but I kinda dig the over exaggerated length and how they look on. When buying them I mentally styled them up with a pair of heels/wedges and then I remembered this was me and I never ever wear heels or wedges despite having a vast collection. 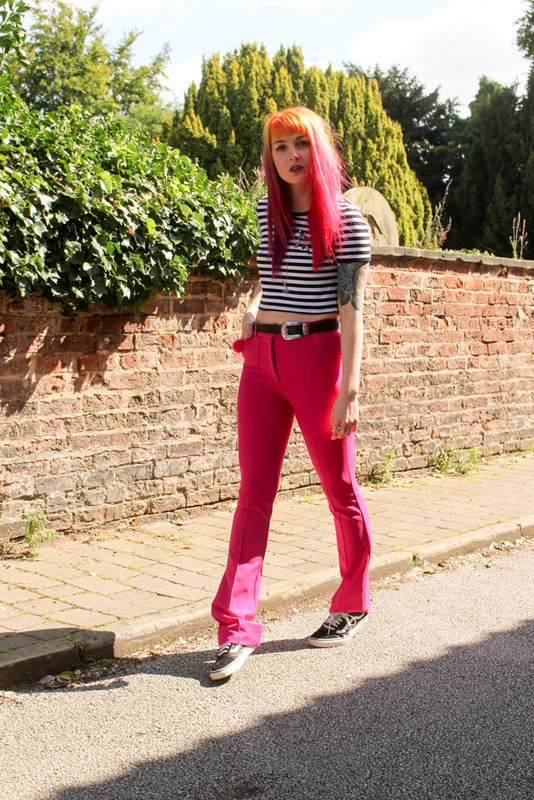 So I stuck to what I know and do best and dressed a what could or should be quite a smart trouser down with a pair of Vans and my new fave crop I've lived in since buying I just loved the overall look when styled and I got serious 70's vibes. 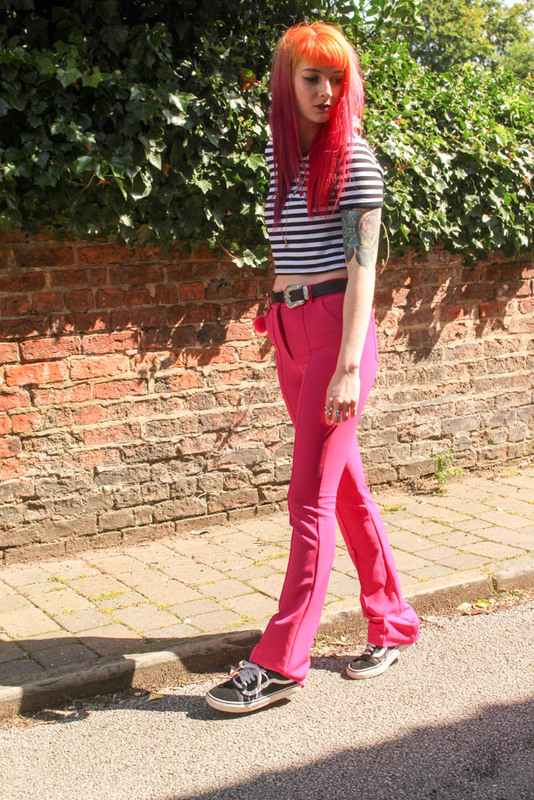 After spending the weekend stomping around in my flares this week and feeling all kinds of fab, I'm now firmly a flares mega fan. Watch this space, it's gonna get a little mental. You look super cute! I kinda want to try flares too but I am scared... I haven't worn them since school like 11 years ago (waaah)! I loooove these! I could never pull this style of trousers off but you just look so cool as always! 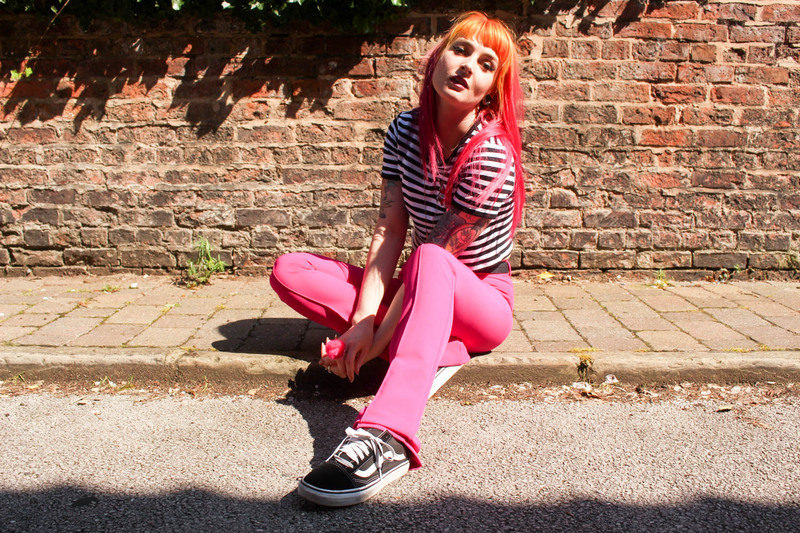 And I love how your trousers match your hair!